We can't stop the waves, but we can learn to surf. We can't CONTROL what life throws at us; the fact that other people don't like our ideas all the time; or that we get sick or that our emotions get the best of us. But, we can learn to go with the flow, in other words...ride the waves. Some people surf. Me? I learned to boogie board. In fact, I became quite a fanatical boogie boarder. 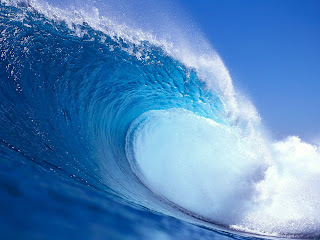 Every summer, I would be out there for hours and hours riding the waves. There are moments when you catch the wave, when there's no sense of being in control. There's no focus on self. You and the wave become "one". There is a presence, a flow and a grace to it. When athletes are in the zone, it doesn't happen because of controlling. It's a quality of presence, of full attention that allows them to tap into a flow. When we are truly empowered, all self consciousness or notions of a self in charge have vanished. We're tapping into the flow of the universe's wisdom, love, strength and power. Meditation is the training to tap into this presence and empowerment. It teaches us how to surf...how to ride whatever waves come our way.